As the story goes, not long after the British defeated the French on the Plains of Abraham, a soldier from the 78thHighlanders gained permission to melt down some cannonballs, turning them into curling stones. With nothing much to do, and a long, cold winter ahead, these Scottish soldiers spent months sliding the stones on the St. Charles River turning them into the first rock-throwers in Canada. It’s a fanciful story that may even be true. Whenever and wherever the first game of curling took place in this fair land, it marked the start of a love affair between Canadians and the roaring game. Since then, of the hundreds of thousands of stones that have travelled up and down sheets, from St. John’s to Victoria, a few have come from the hands of supremely talented individuals. These athletes have worked and trained and practised to be able to curl with precision and accuracy in line and weight. They’ve won championships at the local, provincial, national and international level. They’ve dominated and beaten all those who’ve been in their way. But of this select group, just which ones are the absolute best? That’s what we wanted to try and find out. 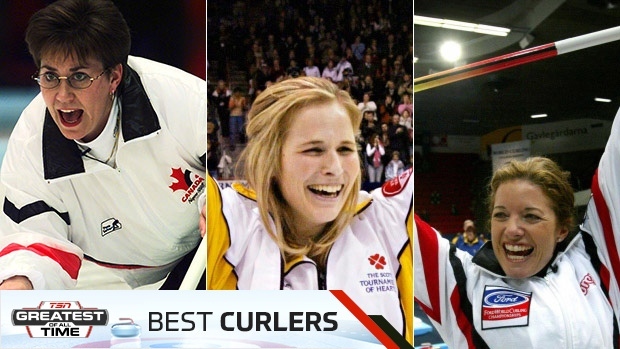 Who truly deserves to be called the best Canadian curlers – men, women, position players and teams – of all time? We assembled a panel to answer that question and over the course of the Scotties Tournament of Hearts and the Tim Hortons Brier, we’ll reveal the winners. We’ll honour the best leads, seconds, thirds and skips, as well as the best teams and the overall best players, regardless of position. It was a difficult task, to be sure. Just compiling a list of eligible curlers proved to be a challenge. How do you compare the top second from the 1950s to one playing today? Is it possible to choose between, say, Ken Watson and Kevin Martin? Or Vera Pezer and Jennifer Jones? Rules have changed, conditions have changed, equipment has changed, training has changed and the rewards have changed. The game played by the likes of Ernie Richardson and his all-family team can’t be compared to that of Brad Jacobs and the Harnden clan. So we asked our panelists to consider which players and teams were dominant in their eras. Which curler was the best at his or her position at the time they were playing his or her best? Even that is no easy task, especially when you consider that no one on our panel got to see a curler like Matt Baldwin in his prime. We know our results will be challenged and we hope they will result in discussions about who should be higher or lower on the list. While there’s no such thing as absolute, we’re pretty confident that our voters have come up with curlers who have earned the right to be called the best in the land. Of course, it would be interesting to see just how those on our list would do if they had to throw melted-down cannonballs.